2017Color-calligraphy is a new art form founded by He Baijun, a calligrapher and artist. 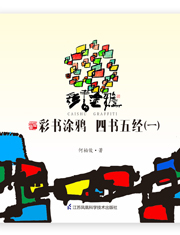 Color-calligraphy is a new art form founded by He Baijun, a calligrapher and artist. Based on the integration of traditional calligraphy with modern aesthetics, he uses multiple colors, fantastic brushwork and bold structures to display a new form of calligraphy. While providing access to the art of coloring, the book is also good educational material for lovers of Chinese culture. The book is divided in two sections. Firstly, a basic introduction to color-calligraphy and its respective artic tools. Secondly, display of creative works from the Four Books and Five Classics, the authoritative books on Confucianism in China, as well as an interpretation of the excerpts, helping readers to learn more about traditional Chinese culture while enjoying the array of colors. • He Baijun's original color-calligraph work Harmony without Uniformity has been used by Russia to bid for World Expo 2020.